The back door can be opened using the back door opener. The back door can be locked and unlocked using the entry function (vehicles with smart key system), wireless remote control or door lock switch. In addition, the power back door (if equipped) can be opened using the power back door switch or wireless remote control. Raise the back door while pushing up the back door opener switch. Push and hold the switch to open/close. 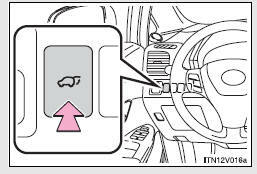 Pressing the switch again while the power back door is operating will cause the operation to reverse. 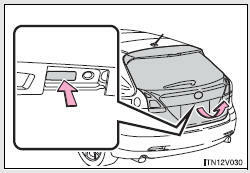 However, the reverse operation cannot be performed for the first second after pressing the switch to operate the door.